The Government confirmed the extension of the IHT exemption for armed forces personnel who die on active service to all emergency services and humanitarian aid workers who die in the line of duty, or whose death is hastened by injury incurred in the line of duty. It will have effect for deaths on or after 19 March 2014. Prior to the Autumn Statement (on 3 December 2014), SDLT was charged on the whole purchase price at a flat rate dependent on the price paid. 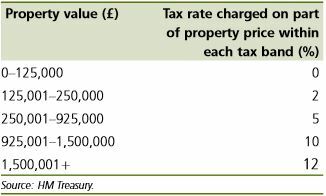 So, if you bought a house for £250,000, your stamp duty rate was 1% – ie £2,500. Increase that to £250,001 and your rate leapt to 3% on the whole amount – ie £7,500.03. That extra £1 paid for the property cost a whopping £5,000 in tax. So, if you buy a property at £250,001, you will pay nothing on the first £125,000, 2% on the next £125,000 and then 3% on the extra £1 – a total of £2,500.03 – a hole lot better than £7,500! The Chancellor said that 98% of house sales will attract less SDLT as a result of these changes.